With the holidays just around the corner, I’m full bake mode. I’ve been looking for a recipe for a sweet treat that’s simple, easy to make, and elegant…but not full of bleached flour, sugar, food dye or other unhealthy things. These cinnamon almonds require just a few simple ingredients, but the end result is not only delicious and fun to eat but also pretty enough to give away as a holiday gift. To make these sweet-and-crunchy little treats, you just need an egg white, some organic evaporated cane juice, vanilla, organic almonds, and lots of ground cinnamon. They are so simple to make, and you can double or triple the recipe if you’d like and give them away as gifts. 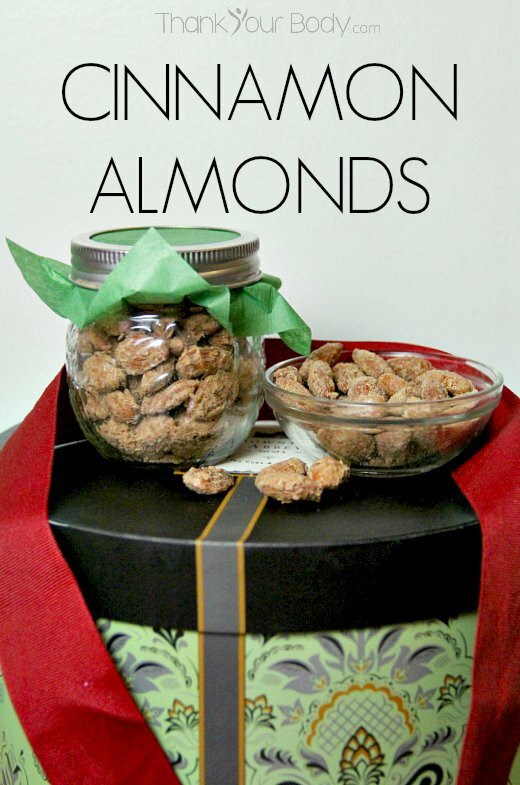 A little half-pint jar full of cinnamon almonds, topped with a square of cute paper or cloth and tied with a ribbon makes an excellent gift for teachers, neighbors, or co-workes! Just whip the egg white until it’s frothy, and then blend in the vanilla. Stir together the egg, sugar, and cinnamon, and then fold in the almonds and stir to combine. Make sure that all the almonds are evenly covered, then spread them on a parchment lined jelly roll pan. Bake at 250 degrees for an hour, stirring the almonds once after 40 minutes to make sure they don’t stick together. Some of the candy coating will probably stick to the parchment paper, but that’s okay…just scrap it up and stir it in with the almonds. After the almonds cool, they are ready to be packaged up (or eaten, depending on your mood). This recipe can also be made with pecans or walnuts, and they are just as tasty as the almonds. Enjoy! This delicious recipe that we adapted is simple, delicious, and will make your home smell amazing. Beat the egg white until it's very frothy (just before it forms stiff peaks). Mix in the vanilla, sugar, and cinnamon. Fold in the almonds and stir until they are totally covered. Line a jelly roll pan with parchment paper. Spread the almonds on the parchment paper in a single layer, making sure that they have room so that they will cook evenly. Bake for 40 minutes, then break the almonds apart and stir them. Bake them again for 20 to 40 minutes, stirring every 10 minutes or so. Baking them a little longer will make them crunchier. (Baking time will be from 1 to 1½ hours). Allow the almonds to cool, then eat or package as you'd like. Do you have a favorite treat for holiday gifts? Share it in the comments!